I have been working on trying to cut down the design of Web. Obviously features will need to be cut, but as a first step I really wanted to see if I could streamline the overview design doc into something significantly more digestible. It is clear from the amount of text of the previous docs that this design is simply too complex, and while the obvious solution is to break it down to its component parts, there had to be some way, at the highest level, that I could summarize it more nicely. In doing this simplification I realized that this game really isn’t right for table top. 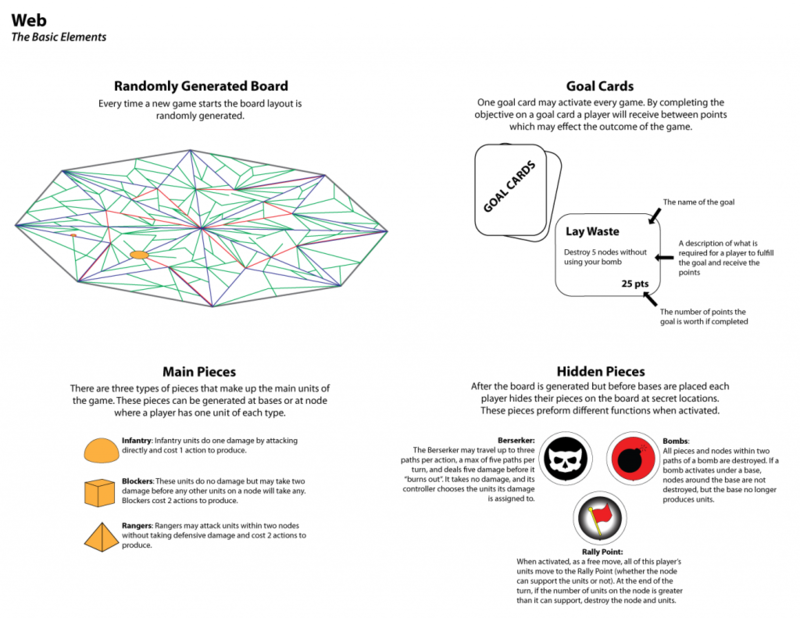 It will probably make a good browser based board game (ironically), but there are five components which I left out of/solved with the new design summary which were cluttering up the original board or making things too complicated. However, some of these components are still in the game, they just don’t need to be addressed in the design doc as they become back end systems (or too specific for the overview). There is no longer a need for board pieces. The web is generated randomly. This also gives an opportunity to have way cooler theming more easily. There is no longer a need to have numbered nodes as players should just be able to select the location of the nodes they want to hide their special pieces on. Score cup and keeping score: this can all be managed by the program. Making it a video game solves the problem of piece clutter. With so many little pieces at different locations things can get cramped. But, with a video game a single icon with a multiplier on it can indicate the number of units of a type at a location. I removed negotiation. It was a nice idea but it would have made games way too long, and while negotiation might be fun in a table top environment it would be hard to implement and limited in a video game. I would like to return to the idea of negotiation as a main mechanic at a later date in another game. I will continue to do paper testing, work on the documentation, and see where this goes.